Saturday afternoon, we found ourselves milling around the kitchen, unsure exactly how to amuse ourselves while waiting for the dishwasher to arrive. It was a bit before 1 pm, and delivery/installation was scheduled for between 1 pm an 5 pm. We didn't want to get too involved in anything. We started some laundry. Finally, I suggested baking cookies. A simple kind of cookie, nothing too involved, that way we could easily put the process on hold. 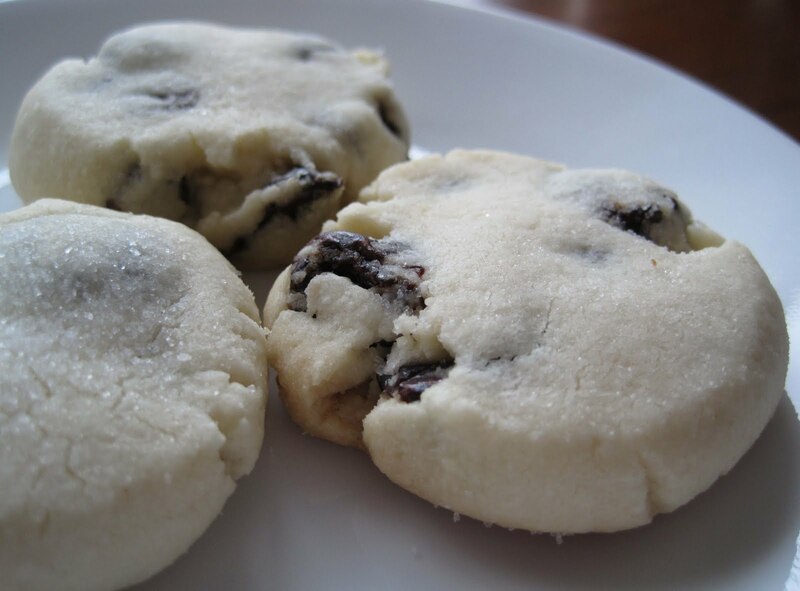 I already had a cookie in mind: Cherry Chocolate Shortbread Cookies. I ripped this recipe out of the coupon section of the Sunday newspaper over the holidays. It's one of those name brand suggested recipes printed on the same page as the coupon for some product. I was excited about it because it uses dried cherries. I like the combination of cherry & chocolate. Unfortunately, most recipes for cherry chocolate baked goodies call for maraschino cherries - yuck. This recipe uses dried cherries, which we almost always have on hand because SP likes to have bags of dried fruit for snacking. So we whipped these up. They're easy to make. The recipe says it yields 3.5 dozen, but we only got 2 dozen - ?! I guess ours are larger than they should be? But they don't look large. They look normal sized. They taste really good. 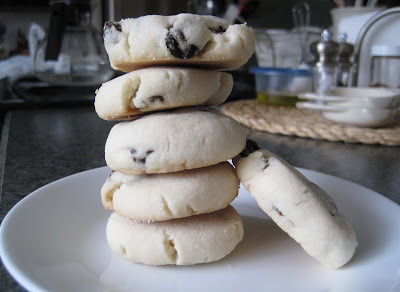 When we make these again, I would use mini chocolate chips or chop a hunk of chocolate into tiny pieces instead of using regular chocolate chips and I'd chop the cherries smaller. 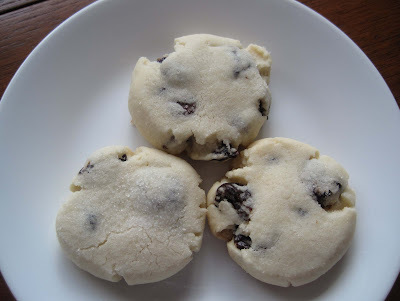 That way, the cherry & chocolate would be more evenly distributed throughout the cookie in lots of tiny pieces rather than scattered in large chunks. Sometimes, you get just a bite of cherry or a just bite of chocolate, which is fine, but when you get a bite of both cherry & chocolate, it's really yummy! I also would drizzle the cookies with chocolate. We didn't drizzle them with chocolate this time because we were feeling kind of lazy and figured they wouldn't really need it. Mix butter, sugar and almond extract thoroughly using an electric mixer. Gradually blend in flour and corn starch. Add cherries and chocolate. Form into 1-inch balls and place on ungreased baking sheets. Pour sugar on a small plate; dip bottom of drinking glass in sugar and gently press down on each cookie to flatten. Bake in a preheated 300 degrees F oven for 20 to 30 minutes, or until bottoms begin to brown. Cool 5 minutes on cookie sheet; remove to a wire rack to cool completely. 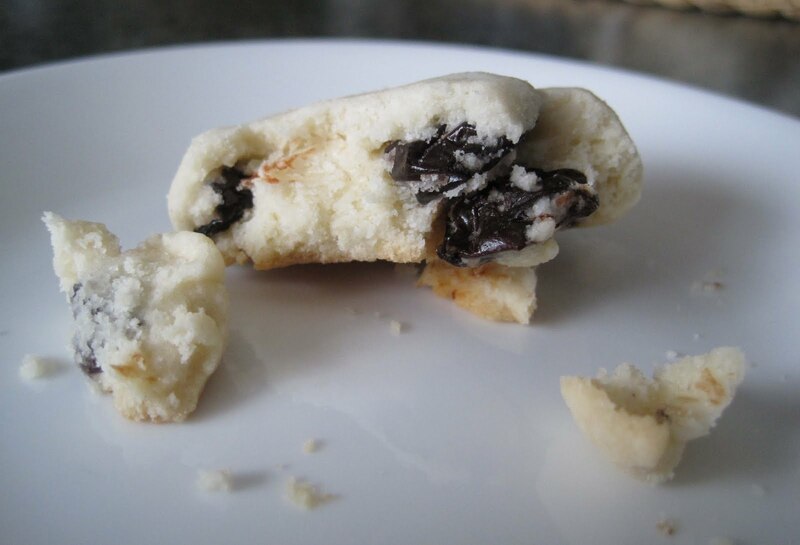 For drizzle: Place 2 ounces chocolate and shortening in a small resealable plastic bag. Microwave on high for about 30 seconds, until chocolate is melted. Snip off corner and drizzle over cookies.